– Train and fight alongside legendary Asgardians such as Sif, Heimdall and the Warriors Three. 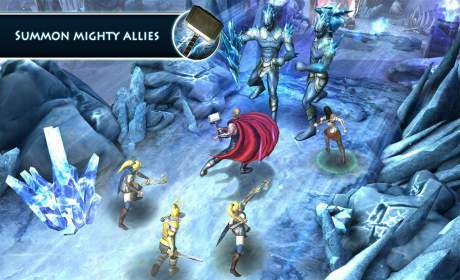 – Summon 7 types of Einherjar, valiant warriors of Asgard, to help you tactically bring down foes. – Upgrade and unleash super abilities for your allies, such as teleportation and healing. – Take action and accomplish fast-paced missions, each with different challenges and goals. – Traverse the Worlds to stand in defense against the Marauders and Dark Elves, and free them with your Allies. – Hack and slash your way through an onslaught of villains from the movie, including Jotuns, Marauders, Rock Giants, Dark Elves and more. 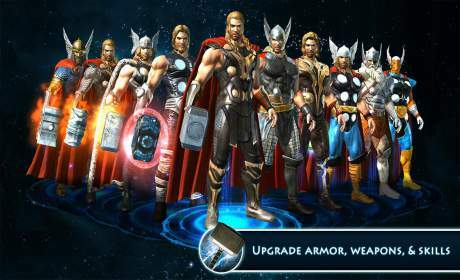 – Unlock and upgrade 10 powerful hammers and armor sets for the hero Thor. 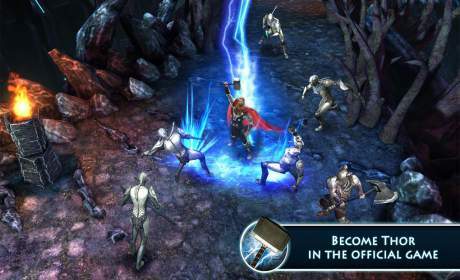 – Unleash Thor’s devastating super skills and then decide which to upgrade and equip for battle. – Battle waves of increasing difficulty against Malekith’s armies in the Survival Arenas. – Compete for the top spots on the weekly leaderboard for unique rewards. – If you can’t beat the world, beat your friends: Tower over everyone on the Friends leaderboard for greater rewards!